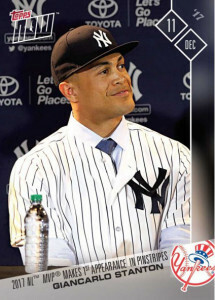 He may be new to pinstripes, but Giancarlo Stanton isn’t wasting any time getting the TOPPS NOW treatment from the venerable card company. The Yankees’ shiny new right fielder has his first baseball card in the famed Yankees garb, with images from Monday’s press conference available to fans until noon ET on Wednesday. Stanton, who slashed .281/.376/.631 in his huge MVP season last year, slugging 59 home runs and driving in 132 runs in the process, joins A.L. home run champ Aaron Judge in the Yankees outfield for 2018. 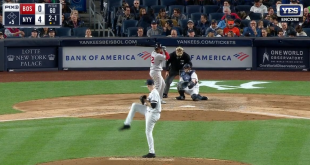 Judge was a hugely popular hit with TOPPS fans, with seven of the top 10 selling cards in 2017 in the format, the joint venture between Topps and MLB that provides the best images to fans on a daily basis.